The words driving experience have grown to mean more to consumers than improved fuel economy, safety or drivability. Cars today are all about providing the driver with an interactive, customizable, luxury experience, requiring new technologies to meet the owners demands. Knobs, buttons and overhead lighting have been replaced by touchscreens, capacitive sensing and mood lighting. For automakers and tiered suppliers to preserve or capture market share, it is essential for them to focus on customer needs and wants through product customization. On top of product customization, OEMs (original equipment manufacturers) have other factors to take into account to stay ahead in the market: productivity, cost control, environmental concerns, product versatility and product performance. The switch from metal to plastics in automotive interiors illustrates the growing importance of those factors. By reducing the overall vehicle weight, plastics allow for a lower carbon footprint and improved energy consumption that result in lower fossil fuel consumption and reduced CO2 emissions. The caveat for switching to plastics is that they have to perform and look like the metal or glass systems they are replacing. With the proliferation of plastics in automotive interior applications, automakers and tiered suppliers are considering coatings that offer performance, robustness, specific haptic and aesthetic effects, as well as improved productivity, durability and chemical resistance. Traditionally, the automotive interior market has been served effectively through single-component (1K) or two-component (2K) systems, which typically require at least 20 minutes of curing time at or above 180°F, which can be unfavorable for heat-sensitive substrates. Additionally, coaters employing 1K or 2K coatings must wait hours and sometimes days to get optimal coating properties. An alternative to 1K or 2K coatings would be energy-curable coatings. Energy-curable coatings are reactive diluents and oligomers that can be crosslinked or cured using high-intensity radiation energy at particular wavelengths or using high-speed electrons produced by an electron beam. The curing process is almost immediate, with the finished product having optimal properties immediately after cure. There is no need to wait hours or days for optimal properties. Through a number of product advancements, energy-curable coatings can now deliver many of the performance requirements in the automotive interior market. A shift to energy-curable coatings would, therefore, allow both OEMs and suppliers (Tier 1 and 2) to benefit from a wide range of advantages. The first one is performance: coating suppliers will be able to achieve good weathering and great scratch, abrasion, stain, and chemical resistance. Then comes sustainability: UV coatings not only save energy because of their faster curing time, they release fewer volatile organic compounds (VOCs). The systems also have implications from a productivity perspective. Indeed, the almost instantaneous cure brought by UV/EB technology allows for increased efficiency and better productivity, which in turn reduce manufacturing costs and coating rejects. Last, but not least, UV coatings enable OEMs to have more freedom in choosing substrates, eliminating the need for pretreatment or the use of a primer in some cases, and also tackling the heat sensitivity issue commonly associated with plastic substrates. Energy-curable coatings can address the harsher automotive standards that many 1K and 2K coatings cannot, due to their higher crosslink density, while maximizing efficiencies and product performance robustness. In this article, we will discuss the advantages of three different UV/EB-curable technologies that can be used for automotive interior applications for film and thermoplastic substrates, as well as a few test results: protective coatings, functional coatings and in-mold decoration (IMD). ), finishes (such as metallization) and stringent chemical testing requirements. Over these decades, energy-curable chemistry has advanced to a point where energy-curable materials provided a quality alternative to conventional 1K and 2K systems. Chemistries that have lower acrylate functional material, but offer comparable hardness to traditional highly functional acrylates, have been developed. Advancements now include energy-curable waterborne polyurethanes and stable energy-curable waterborne emulsions that offer outstanding scratch and abrasion resistance, plus excellent clarity and chemical resistance. These technologies represent the best of both worlds in the sense that conventional 1K and 2K chemistries can be incorporated into energy-curable chemistries. The beauty of energy-curable chemistries is that the process is no different from the current coating process, except for the installation of a UV or LED lamp at the end of the line  or over the mold for in-mold decoration applications. What also remains intact, for chemistry converts, is the formulation foundation, although the terminology changes. Hydroxyl functionality is replaced with acrylate functionality as it relates to reactivity and, somewhat, hardness. Molecular weight and glass transition temperature fundamentals transfer between the chemistries, i.e. the higher molecular weight, the softer the material and the higher the glass transition temperature, the higher the hardness. Using dual cure or hybrid chemistries makes learning the differences even faster. It may not be that simple, but it lays the groundwork for quicker adoption of the acrylate chemistries. In Table 1, energy-curable chemistries are compared to conventional water- and solvent-based 1K and 2K chemistries. The thermally cured silicone hardcoat was cured at 130°C for 60 minutes; the water-based polycarbonate polyurethane dispersion (PUD) was cured for 30 minutes at 80oC. Physical properties were tested after 48 hours at room temperature. The energy-curable coating technology was cured with 1200 mJ/cm2 using 236 watt/cm fusion lamps equipped with two medium-pressure mercury bulbs, as measured by an International Light ILT 490 Profiling Belt Radiometer. For the thermally cured silicone hardcoat, the dry coating thickness was 6 to 8 microns, and the dry film thicknesses of the remaining coatings were 10 to 12 microns. The coatings were applied to polycarbonate substrates for testing. Thermally cured silicones are known for their superior protection, hardness and outstanding chemical resistance. These properties make them ideal for coating various automotive parts. An additional advantage of thermally cured silicone hardcoats is their high performance at lower film builds. Conversely, there are two drawbacks. First, adhesion can be problematic on plastic or plastic blends. In most cases, a primer coating is required to achieve adhesion. Secondly, their high processing temperature of 130°C limits their applicability on many automotive plastics. Single-component water-based PUD coatings offer lower processing temperature and better adhesion. However, they offer limited protection. To achieve good chemical and scratch resistance, a 2K system is required, and the waterborne PUD is crosslinked with a multifunctional isocyanate. These mixtures commonly require additional curing time (as many as 5 days) to achieve optimal performance. The use of monomeric isocyanates introduces health and environmental concerns that are the focus of many legislative debates across the globe. That being said, one- or two-component water-based PUDs cannot achieve the scratch, abrasion and chemical resistance required in the ever-changing automotive standards. Modifications of the chemical backbone, such as incorporating fluorination or glycol ethers, can improve chemical resistance, but crosslinking is critical in the performance of 1K or 2K systems. The downside of improving crosslinking of such chemistries is the time required. With energy-curable chemistries, this is not the case. Once exposed to UV or energy sources, radicals are generated, cure occurs quickly, and the coated part is ready for use. The lightning-fast curing, combined with the maturation of the chemistries, make energy-curable chemistries ideal for todays automotive coating protective needs. In Table 1, a bio-based di-functional, UV-curable PUD and a UV-curable PUD emulsion are compared to a traditional UV-curable technology, thermally-cured silicone, and 1K and 2K waterborne PUD. The bio-based acrylate, having a high glass transition temperature, offers performance similar to traditional multifunctional urethane acrylates. After cure, coatings can achieve excellent chemical resistance and low-haze development after abrasion delivered in a low viscosity package, eliminating the need for solvents and performance compromises to meet higher coating solids needs. As sustainability and long-term environmental concerns continue to grow, the drive to alternative solvents, lower power consumption and more sustainable products will remain. Waterborne energy-curable technologies are designed to fit these needs. 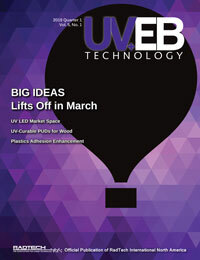 Water-based UV needs only enough power to remove the water, followed by exposure to a UV or electron beam (EB) source. No additional oven time is required to get sufficient cure, as with 1K and 2K systems. The fundamental chemistry benefits of energy-curable technology can be used to improve the performance of conventional one- or two-component systems as well as creating a hybrid curing coating. In Table 2, water-based energy-curable technology is blended (1:1) with single-component water-based polycarbonate PUDs and retested. After water evaporation, the dry coating thickness was between 10 and 12 microns and was cured with an energy density of 1200 mJ/cm2. The incorporation of energy-curable technology reduced the haze after abrasion by 25% and significantly improved automotive crème resistance. The failure mode that is seen with sunscreen testing changes from coating blistering to a reduction in gloss (~20% drop in 20° gloss retention) after exposure. This similar improvement can be expected for similar one- or two-component solvent- or water-based materials blended with energy-curable chemistries.
) and acrylate chemistries allows formulations to have the best of both worlds. Various literature platforms outline a number of nucleophiles, such as hydroxyl functional acrylics and polyols, thiols and acid functional oligomers that are used in automotive interior applications, but lack chemical resistance. Nucleophiles with hydroxyl and acrylate functionality and electrophiles containing an isocyanate (NCO) functionality and acrylate functionality in the same backbone can be blended together. This allows formulators to have the best of both worlds and produce a coating with increased flexibility, lower volumetric shrinkage and better chemical resistance. The implementation of such polyaddition reactions can create a coating with a similar hardness to higher functional acrylates at lower acrylate crosslink density with greater ductility. Another benefit of employing combined chemistry is overcoming line-of-sight limitations on complicated 3D objects on which the coatings in the shadow areas do not cure (excluding electron-beam cure). Incorporating these technologies can reduce this effect through a two-component curing process or single-component moisture cure process. 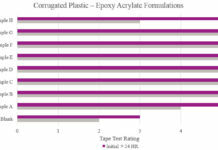 Charts 1 and 2 compare a traditional acrylate hardcoat with a combination of electrophile acrylate (NCO-bearing acrylate group(s)) and nucleophile chemistry (OH-bearing) poly-addition reaction, followed by curing with UV sources. Thermally curing only the nucleophile does not offer many performance benefits, such as chemical and solvent resistance. However, combining thermal and energy-curable technology is a performance game-changer. Combining nucleophiles and electrophiles creates a coating that has lower acrylate crosslink density than that of a hexa-functional acrylate, yet offers overall lower haze values after abrasion. Dual cure technology introduces ductility that is customarily not observed in a highly functional system. Higher functional systems are most often too brittle to coat and require special blending with lower functional acrylate chemistries to reduce cracking upon cure, with a minimum increase in weatherability. Another benefit of hybrid or dual cure technology is reduced shrinkage upon cure. Volumetric shrinkage can be reduced to <5% and curl upon cure can be reduced 90% while maintaining excellent protective properties that meet many automotive interior needs. One of the drawbacks of many highly functional (five or greater acrylates) coatings is poor weatherability. 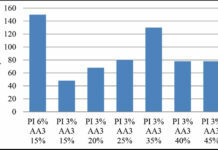 In Chart 2, the weatherability of a coating crosslinked by a dual cure mechanism is shown to be four to five times better than a standard hexa-acrylate used in automotive headlamp applications. Traditional hardcoat systems tend to not perform well in accelerated or natural weathering testing. The failure mode is a loss of gloss through microcracking of the coating. To achieve similar performance, 3% to 6% of a light stabilizer package would be needed for traditional multi-functional acrylate hardcoat to achieve a comparable result. Dual cure technology is able to achieve 3500 hours in QUVA without the use of any light stabilizers. It is clear that a combination of acrylate functionality with conventional chemistries can create a system that delivers superior weatherability with hardcoat properties, with the added benefit of low curl upon cure. In addition to pure performance advances, the use of dual cure resins can result in crosslinked, tack-free surfaces prior to UV exposure. This opens up a number of potential applications, such as high scratch-resistant coatings for thermoforming applications, which will be discussed later in this article. The use of functional coatings allows OEMs to create coatings that function in ways not seen before. Through a thorough understanding of chemistries that provide certain functionalities, multiple options for upgraded features for consumers are available. The ability to create coatings with properties ranging from easy-to-clean to a myriad of haptic feels allow automakers to capture markets that have been outside their reach in the past. This can all be done while incorporating improved scratch and chemical resistance. Previously, a soft touch coating has been an incredibly daunting task to achieve with energy-curable systems, resulting in either tacky/rubbery or smooth and hard perception, with very little in between. Recent developments have provided a set of soft feel products that can be used to create a multitude of feels, allowing customers to fine-tune formulations to achieve the type of feel they desire. Formulators have determined how to use a combination of crosslink density and modified glass transition temperatures to create a soft feel urethane acrylate oligomer, allowing users to create excellent rubbery feel coatings for automotive parts. Modifications to glass transition temperatures and overall crosslink density can increase not only scratch and chemical resistance, but also hydrolysis resistance. The combination of these resins, fine-tuned for soft touch applications, along with specially selected fillers, allow OEMs to customize the feel they desire for applications such as knobs, handles, gear shifts and many more. As buttons and knobs relinquish their control over automotive interiors, capacitive sensors and touch screens are ushering in a more technologically advanced display than that of years past. This continuous progression is forcing automakers to seek out solutions for the inevitable fingerprints that appear on these displays. The use of acrylated materials that contain fluorine give automakers the ability to create coatings that are not only scratch-resistant, but also stain-resistant. The inherent low surface energy provided by fluorine enables formulators to create coatings with lower surface contact angles. By modifying the contact angle of the coating surface, the unwanted contaminants from fingerprints are unable to spread, wet out or penetrate the surface of the coating. By remaining at the surface, the contamination can be removed more readily. These properties all can be achieved while maintaining good scratch resistance of the cured layer. Outside of fluorinated chemistries, another avenue that can be pursued is the use of silicone-modified urethane acrylates, which also allow the surface contact angle to be modified while maintaining scratch resistance. Unlike previous systems where performance decreased after abrasion or time, newer materials allow for longer coating lifespans that maintain the desired performance even after abrasion, due to the fact that these silicone materials are reacted into the backbone of certain urethane acrylates. Picture 1 emphasizes the ability of silicone-modified urethane acrylates to maintain easy-to-clean properties even after abrasion. The use of silicone-modified urethane acrylates offers automakers the added benefit of creating matte coatings that also have easy-to-clean properties. The lower gloss coatings also can maintain those properties even after abrasion of the surface. The ability to increase both productivity and customization of parts has been a driving force in establishing in-mold decoration (IMD) in various applications as far back as 1970. With increasing federal regulations targeting carbon dioxide emissions, the need to replace heavy metal parts with lighter plastic parts has become a reality for all automakers. The use of plastic parts allows not only for an expansion of interior customization, but also a boost in fuel efficiency without sacrificing the aesthetic of automotive interiors. IMD, which consists of both in-mold labeling (IML) and in-mold films (IMF), allows parts to be tailor-made and decorated differently in a dynamic and cost-effective way. In the process of IML, patterned or printed films are inserted into an injection-molding machine, the resins are then injected into the mold, adhering to and/or encapsulating the patterned film. The IMF process, generally used for 3D parts, uses a patterned or printed film that is formed and then placed in an injection-molding machine and molded with the resin. These technologies, in combination with UV-curable materials, are a perfect pair, providing chemical and scratch resistance without impeding the efficiency of the process. Typically, IML is used in applications that require minimal draws, such as simple structures and flat panels. These types of applications require much less elongation from the polymer matrix, which allows for increased crosslink density. Materials with higher functionalities, such as nona- and hexa-functional urethane acrylates, are better suited for these types of coatings. The increased amount of crosslink density in the cured films creates materials with high surface hardness and scratch resistance, lacking a large amount of flexibility. While scratch and chemical resistance are incredibly important, the need for impeccable outdoor durability cant be forgotten, as it ensures the longevity of the coated parts. In regard to weathering, aliphatic urethane acrylates with moderate functionality show improved weatherability when compared to the higher functional materials. Urethanes with moderate functionality allow for a higher percentage of double-bond conversion before vitrification sets in, leaving less unreacted material available to move around when exposed to elevated temperatures during outdoor exposure. Using a combination of materials that provide both good scratch resistance and better weatherability will allow for the creation of coatings with both excellent weatherability and superior scratch resistance. IMF, as mentioned previously, is used to create materials that have complex 3D configurations. These types of applications require a coating that has not only flexibility but also a higher degree of elongation than those used for IMD. Materials with inherently high elongation numbers after curing will allow for parts that are able to be formed around complex pieces used for automotive applications. Generally, materials that have greater than 100% elongation can be used to form around both simple items and complex items with deeper draws. Materials with a higher degree of elongation after curing can be formed around a multitude of parts with simple shapes as well as complex shapes with deep draws. It is possible to use other types of chemistries within the UV-curable realm that will allow for formable materials, such as a dual cure approach. A dual cure approach would allow for materials to be cured thermally and formed, followed by UV curing to obtain the final properties. The use of isocyanate-containing materials in conjunction with hydroxyl-containing materials or acrylic materials with higher glass transition temperatures will provide materials that can be formed after the thermal reaction takes place. These coatings not only allow for forming after the thermal step, but can reach scratch resistance values equivalent to hexa-functional urethane acrylates after UV curing takes place. Another intrinsic property of these types of systems is a decrease in volumetric shrinkage, greatly reducing curl, in comparison with higher functional acrylate coating layers, without diminishing the scratch resistance. As federal regulations become more stringent in regard to volatile organic compounds (VOCs), a need for solutions that dont contain solvent has formulators switching to not only 100% solids but also waterborne systems. Currently, multiple waterborne UV-curable polyurethane dispersions (PUDs) on the market can be used in these applications as well. These materials can produce films that are tack free after the water is evaporated, which allows them to be formed around 3D and complex parts prior to UV curing. Coatings developed from UV curable PUDs have similar performance properties to the solvent-borne and 100% solids materials mentioned above, without the added VOC constraints. The fast cure response, excellent chemical resistance, robust performance and adaptability to enhance various chemistries make energy-curable coatings ideal for automotive applications, broadening the scope of automotive customization possibilities for OEMs. The higher crosslink density of UV coatings makes them perfect for todays tougher automotive durability and chemical resistance standards as indicated in Tables 1 and 2. Recent structure-property advancements now allow formulators to develop energy-curable coatings with a variety of haptic feedbacks while maintaining excellent chemical resistance, eliminating the either-or factor that has been seen previously. Thanks to this breadth of energy-curable technology, the development of a multitude of aesthetic finishes for parts is made possible, while simultaneously exercising a positive influence on the environment with lower VOC generation and energy consumption through shorter drying and curing times. The unique adaptability of UV/EB-curable technology and the singular way it resonates with both the consumers demands and automakers challenges make energy-curable coatings an ideal choice for OEMs by giving them a decisive and long-term competitive edge in the market. Marcus Hutchins (marcus.hutchins@allnex.com) is a technical specialist in the technical service group of allnexs Radcure business unit. He has broad experience in the chemistry and formulation of UV/EB-curable coatings, inks and adhesives. Jennifer McClung (jennifer.mcclung@allnex.com) is a development chemist in the Radcure group for allnex, with a focus on consumer electronics and industrial plastics.